Tibetan New Year Traditions | WWAM Bam! Losar Zang! 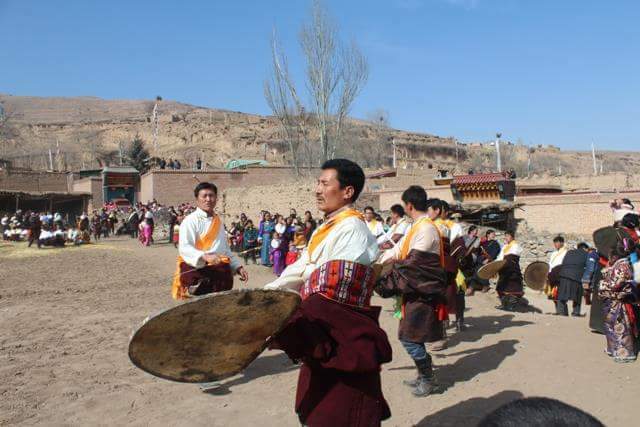 Losar is Tibetan New Year in Qinghai. It’s at the same time as Chinese New Year, and is full of colorful and fun traditions. Some of them are similar to Chinese traditions such as lighting fireworks and hanging red lanterns at the gate, but some are uniquely Tibetan. 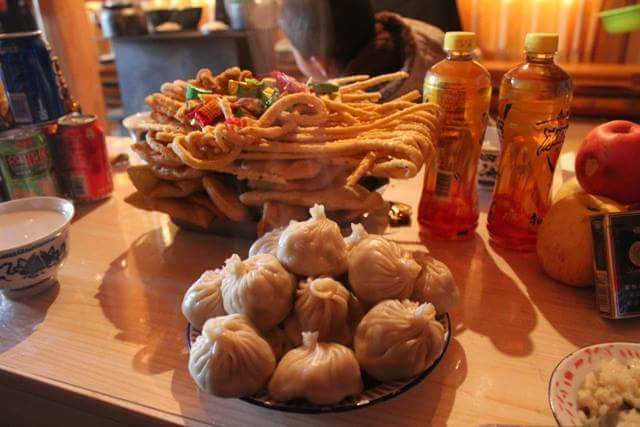 Here is what a typical Tibetan New Year is like for me and my Tibetan family in eastern Qinghai province. We stay in the village for a week or a little longer, during the 15-day New Years festivities. We usually miss out on many of the preparations. By the time we arrive, there is a table full of dried fruits and fried noodle-looking bread with candies sprinkled on top. One thing that I enjoy, that is similar to my own holiday traditions, is the presence of a New Year Tree. It is usually a big branch from a thorny plant, perfect for adding red dates and candies to as decorations. The tree is usually displayed prominently in the home. Once decorated, it isn’t touched until after the holiday is over. It’s roots are kept in a pot of water. Once when we returned to the village in the spring, the tree at my in-law’s home greeted us with bold green leaves on the branches. However, this is an increasingly rare sight, as more and more the fake “Christmas tree” style trees are starting to replace the real trees. The first day of Losar, all the sons go to their village homes and celebrate with their parents and families. On the second day, everyone should go to their wife’s family to visit. When meeting others on the village paths, people should say Losar Zang (Happy New Year) and offer apples to each other. Most of the following days are spent visiting relatives and eating copious amounts of food. Women are busy making food and pouring tea. Men are busy sitting on the heated platform beds and having lively conversations while drinking barley liquor and smoking cigarettes. Children, dressed in bright traditional clothing play happily with their cousins and neighbors. They receive New Year money, but it is not generally encased in red envelopes. There are some lively village activities throughout the weeks. In my husband’s village there are drum performances, plays, a basketball tournament, and dance performances. Villagers prepare an ugly female figure out of roasted barley flour and water which represents bad and negative things. Each family donates some wet roasted barley flour to the cause, after rubbing it on their faces, necks and arms, to remove any bad things from their bodies, and to start the New Year off right. The figure is then carried out of the village and dumped into a gulley, followed by a lot of fire crackers, thus removing the bad luck from the village. New Year in Tibetan villages in Qinghai is a happy and colorful time, especially for children. Visitors bring gifts like boxes of milk, fruit, and snacks. Visitors are sent home with similar gifts when they depart. It is rude to visit a family without bringing some kind of gift. Gifts should also be excitedly refused several times before finally being accepted. Going to my husband’s home for New Year is always a very interesting and educational experience. I continue to learn a lot every year and am able to help and contribute more and more as we go along. If you’re looking for a non-crowded way to spend the New Year, I recommend a visit to a Tibetan village in Qinghai.